Some Prolific Works ebook giveaways require a redemption code in order to allow authors to share their giveaways with specific people. 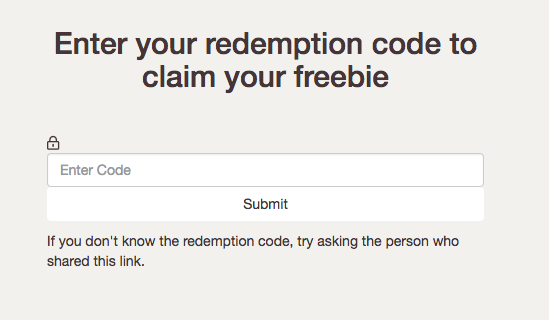 If a giveaway requires a redemption code, the giveaway page will only show a gray box with the text "Enter your redemption code to claim your freebie". If you don't know the redemption code, reach out to the author of the book to see if they will let you know what it is. Authors may or may not choose to share the redemption code with you. Enter the code that you received from the author in the text box labelled "Enter Code". These codes are case sensitive, so be sure to enter them as shown by the author. Once you have entered the correct code, you will be brought to a claim page where you can claim the book by inputting your name and email address and and selecting "Claim! ".